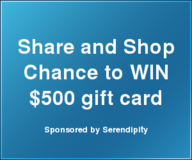 Become a fan of Serendipity Boutique on Facebook and win a $500 gift card. Today we launched a sweepstakes on Facebook, look for the sweepstakes tab on the left hand side. Share the contest with your friends because if you win, 2 of your friends will win a $100 gift card each. If one of your friends wins, you could be the one to win a $100 gift card. Click on the link above. We have TONs of new fall items. Check out it out! < Previous Tax FREE Weekend – August 5th-7th!